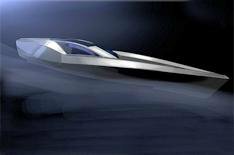 Bentley backs Atlantic pedalo bid | What Car? Bentley is backing a charity project by two engineers who will attempt to cross the Atlantic in a pedalo in a record-breaking time of less than six weeks. A pedalo-powered Atlantic crossing has only ever been achieved once before, in 1994, and that took 111 days. Mike Sayer and Mark Byass aim to do it in 38. The pair hope to raise 250,000, which will be shared between the Motor Neurone Disease Association and the Make A Wish Foundation, a charity for children and young people with life-threatening illnesses. The project will be carbon neutral, with solar power generating the electricity required for essentials such as de-salination of water and to power their iPods, which have been loaded with 30,000 songs to help them pass the time. Bentley is helping with materials, analysis, ergonomics and packaging. However, its fine leathers and polished wood veneers have been left off the pedalo's spec list. The 'boat' is nine metres long, made of carbonfibre, is self-righting and has a cruising speed of three knots. It will be on display at the London Boat Show in January and on Bentley's stand at the Geneva motor show in March. The crossing is to start in December 2011 and will cover 2900 land miles (2500 nautical miles) between La Gomera in the Canary Islands and English Harbour in Antigua.